Fight Racism! Fight for Civil and Democratic Rights! The Alliance-Philippines (AJLPP) in the name of the more than 5 million Filipino-American immigrant community militantly supports the national mobilization in Arizona on May 29th against racism expressed in SB 1070 that legalizes racial profiling. AJLPP activist from the ProPeople YouthKMB will be on the chartered bus from Los Angeles, CA to Phoenix, AZ to participate in a national protest at the Artizona State Capitol on May 29. With them is a militant contingent from AFFIRM. Los Angeles- Fight Racism! Fight for Civil and Democratic Rights! 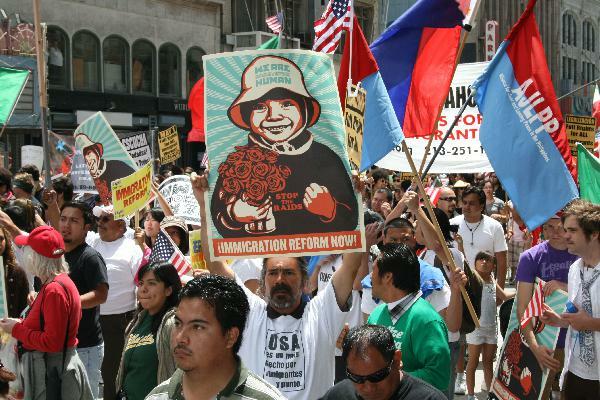 The Alliance-Philippines (AJLPP) in the name of the more than 5 million Filipino-American immigrant community militantly supports the national mobilization in Arizona on May 29th against racism expressed in SB 1070 that legalizes racial profiling. AJLPP activist from the ProPeople YouthKMB will be on the chartered bus from Los Angeles, CA to Phoenix, AZ to participate in a national protest at the Artizona State Capitol on May 29. With them is a militant contingent from AFFIRM. Arizona Senate Bill 1070, a recently-signed law which legalizes and encourages the racial profiling of immigrants. The contemporary freedom ride is organized by the ANSWER Coalition. After calls to boycott Arizona and massive May Day rallies in which millions marched in the street against the fascist Arizona legislation, the militant fight to overturn the law must continue. The AJLPP also condemns President Obama's unveiled plans to further militarize the US-Mexico border with an additional 1,200 national guard, funded with $500 million of taxpayers' money. This goes with Arizona Senator John McCain is calling for an additional 3,000 national guard along the AZ-Mexico border alone. We condemns Obama’s and the democrat double speak: while calling for legalization of the so called “ undocumented immigrants, acts to militarize the border and had deported the highest number of “illegal immigrants more than President Bush had. The Alliance (AJLPP) will join with ANSWER and our other allies to go to the heart of the state leading the new wave of fascist, racist attacks against immigrants and immigrant communities. The AJLPP calls on all descendants of immigrants and immigrants and their advocates to join the Phoenix protest against SB 1070! In order to purchase tickets, please visit www.answerla.org.